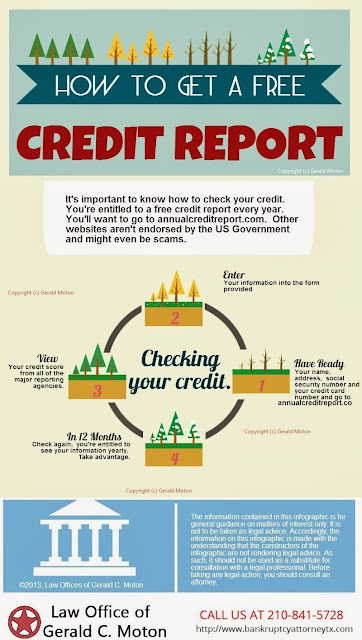 Its important to know how to check your credit . A credit report includes information on where you live, how you pay your bills, and whether you’ve been sued or have filed for bankruptcy. You are entitled to a free credit report every year. Only one website, http://www.annualcreditreport.com, is authorized to fill orders for the free annual credit report you are entitled to under law. Other websites that claim to offer free credit reports, are not endorsed by the US Govt. and "may" even be scams. Our San Antonio Bankruptcy Attorney has created the below infographic to help you understand "How to get a Free Credit Report". If you'd like to get a free consultation, please contact us . If you look at the report and find the wrong data, https://www.free-creditreportuk.co.uk :you need to file an https://www.mycreditscorecheck.co.uk :objection to it. Here you need to contact the station that gave the data. Many people make mistakes that they believe that scores will be compromised when fighting wrong data, but this is a mistake. Conflict helps you to score your score. Therefore, please be very confident when you make a dispute. Get your credit score, Credit report for free for no charge.